Malek Hosseini, S., Ahmadi Najafabadi, M., Askari, H., Sadegh Nejad, E. (2014). Genotype-Dependent Differential Response of Cereal Germinating Seeds Against Trinitrotoluene. Journal of Applied Biotechnology Reports, 1(3), 105-110. Smaiel Malek Hosseini; Milad Ahmadi Najafabadi; Hossein Askari; Ehsan Sadegh Nejad. "Genotype-Dependent Differential Response of Cereal Germinating Seeds Against Trinitrotoluene". 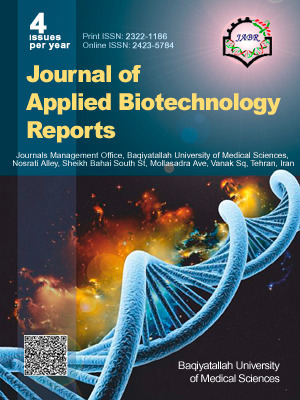 Journal of Applied Biotechnology Reports, 1, 3, 2014, 105-110. Malek Hosseini, S., Ahmadi Najafabadi, M., Askari, H., Sadegh Nejad, E. (2014). 'Genotype-Dependent Differential Response of Cereal Germinating Seeds Against Trinitrotoluene', Journal of Applied Biotechnology Reports, 1(3), pp. 105-110. Malek Hosseini, S., Ahmadi Najafabadi, M., Askari, H., Sadegh Nejad, E. Genotype-Dependent Differential Response of Cereal Germinating Seeds Against Trinitrotoluene. Journal of Applied Biotechnology Reports, 2014; 1(3): 105-110. (Barley var. Bahman) and susceptible (Durum wheat) genotypes. Under higher TNT concentration, barley had the highest root length and root number and also was the best in dry matter allocation towards root tissues. We measured the different parameters for roots of 6 species of cereals, that oat was sensitive plant when exposed to TNT than others. With emphasis on the wide-range adaptation of cereals to climate and soil characteristics and their extensive and fibrous root systems, it is suggested that barley genotypes especially Bahman variety can be a confident plant to carry the essential genetic structure for explosive detection.